“Compliance” is a buzzword used by governments, regulators, and employers for the process of following rules. Compliance rules are in place either to protect business and markets, or to protect individuals by guiding them on how to follow regulations. However, rules can be misunderstood. Therefore, the challenge shifts to identifying what more must be done to ensure that the employers and the employees do comply with regulations. In this article, we will look at this challenge in detail. As a response to mitigate this, I will outline how we can instill the spirit of “why comply” by using examples that feature compelling creative Instructional Design approaches. High profile areas of business –especially anything connected to revenue and markets– are governed by regulations. These are sets of rules set out by government bodies on how businesses should operate – covering trades, financial dealings, competition rules, safeguarding, and more. Rules on insider trading, antitrust, or competition are in place to ensure that financial markets operate fairly, so no party has an advantage over another. Rules on workplace behavior and health and safety are in place primarily to safeguard the people at work. Let’s take a look at a couple of examples that explore how and why rules can be misunderstood – either because they try to set standards for personal behavior which is complex and can be challenging, or because they set out strict methods of operation, based on market behavior. Compliance Simplified Example 1: Respect in the workplace. Respect in the workplace, or in any place, can be a difficult subject to discuss. 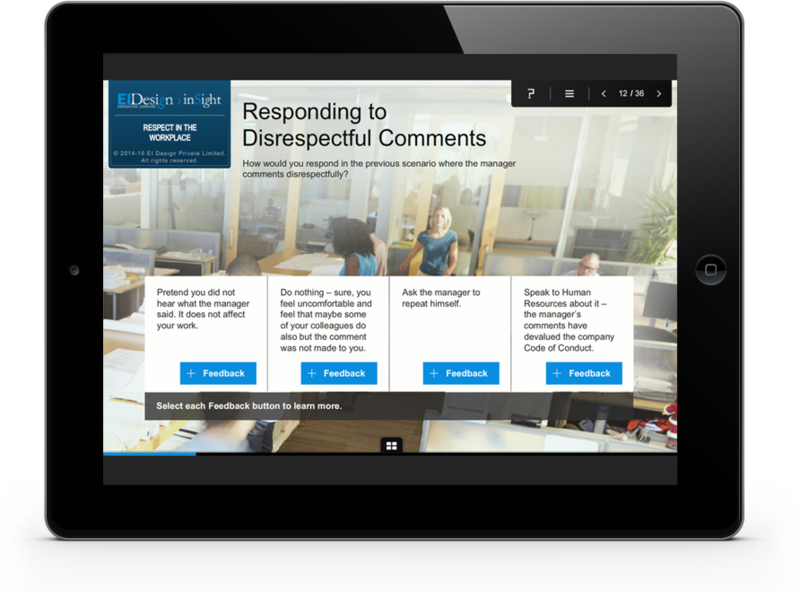 People do not like to think they are behaving disrespectfully – most people believe they behave well with colleagues and others they encounter in the workplace. That’s because respect is not regulated – it is set by an internal bearing, based on our morals and ethical perspectives, which are in turn derived from our upbringing, past experiences, home lives, and even faith. Telling someone their behavior is disrespectful to you or to others can be difficult. Respect is often only noted by its absence and by the person who is not being treated with respect. Huge developments in anti-discrimination movements have made discussions about respect (or a lack of it) in the workplace easier to lead. What can be done: Let me share how we have handled two important aspects to meet the mandate of respect in the workplace. In the first instance, we have shown how we can build sensitivity to recognize disrespectful behavior. Alongside, we have added a simple test to guide the learners and help them not cross the line. Responding correctly to disrespectful comments. In this instance, using a situation analysis approach, we highlight the consequences of each choice made by the learners. Making the learners see the impact of their choices, we can increase the probability of right action. Compliance Simplified Example 2: Combating bribery in business. Bribery and corruption is another contentious area. While it is simple to explain the concept and what constitutes a bribe or corrupt behavior, the difficulty lies in ensuring that learners apply the concept and demonstrate expected standards of behavior. 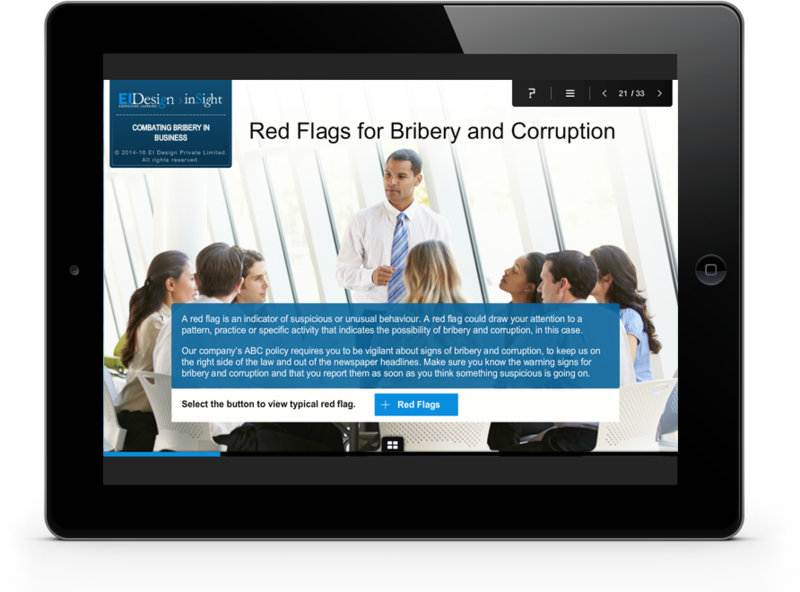 Bribery can easily become the norm – a standard way of doing business with people. While to an outsider, bribery or corruption may be obvious, it may be invisible to someone who thinks it is normal business practice. Gift-giving, hospitality, and entertainment are also tricky areas to negotiate – when does a gift become a bribe? While many countries have national legislation on bribery and corruption, and the laws of some countries cover behavior beyond their jurisdictions, there are no monetary limits on what constitutes a bribe. Understanding when a gift could be considered a bribe is crucial to understanding the entire concept – and this can be a minefield for employees and managements. How Can We Handle These Dynamics? Through our creative Instructional Design approaches for compliance courses, we have defined an approach we term as Compliance Simplified. The examples shown in this article have been picked up from this approach. Take complex concepts and demystify them for learners. Use simple explanations, placing learners into challenging scenarios and asking them to choose a way out – an opportunity to choose the right path. Explain the consequences of each choice made before posing another similar dilemma – testing the learners’ understanding along the way. I hope this article was useful in seeing value in our mandate Compliance Simplified and how it can influence and trigger the right behavior. We believe only when this objective is achieved, would the compliance mandate hit the bull’s-eye. 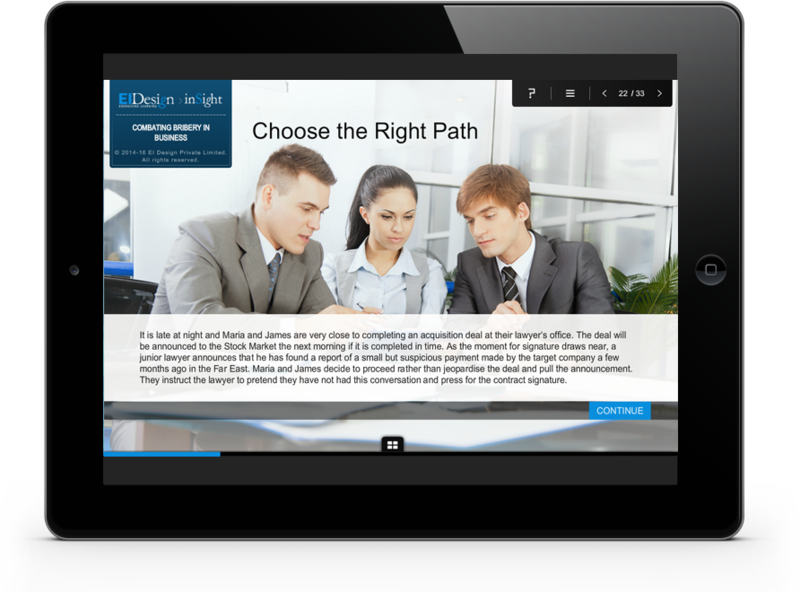 Using innovative and creative Instructional Design techniques for compliance is a very significant practice at EI Design. Acknowledgement:This article was conceptualized by our business associate Helen O’Gorman who shares my passion to make compliance courses immersive and engaging.